Sophomore forward/midfielder Bridget Settles scored the lone goal, her eighth of the season, in the field hockey team’s 1-0 win against La Salle. 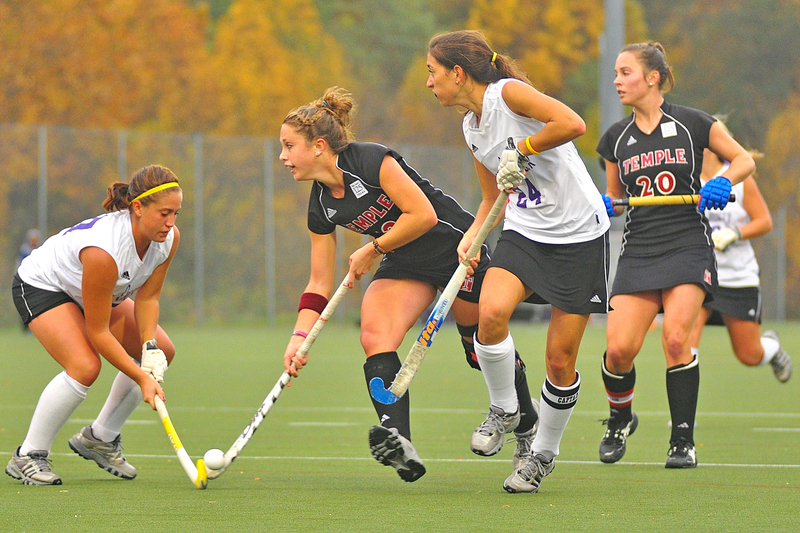 DAVID HAMME TTN The field hockey team’s offense struggles to advance the ball against La Salle’s defense. The Owls won, 1-0, Sunday. A trend seems to be emerging on the field hockey team’s scoresheet, and its name is sophomore forward/midfielder Bridget Settles. Settles scored the lone goal in the Owls’ 1-0 win against inner-city rival La Salle (7-11, 2-3). Senior captain and midfielder Charise Young shot a thunderous penalty corner toward Explorers junior goalkeeper Emma Ruth in the second half. Settles tipped the shot to the upper right corner of the net for her team-leading eighth goal of the season. “Charise had a great shot, and I was lucky enough to be in the right spot to hit it home,” said Settles, who is the reigning Atlantic Ten Conference Player of the Week. The Owls, who improved to 6-11 overall and 2-2 in the A-10, started the first half a little flat, with no penalty corners and only two shots, neither of which were on goal. Senior defenders Kate Stewart and Kristen Wanner led a Temple defense that only allowed one penalty corner and two shots on goal by La Salle’s offense. Temple dominated the second half. The Owls forced seven penalty corners, including the one that registered Settles’ goal. Senior forwards Mandi and Kasey Ruth made some smooth passes in the first half, and Mandi Ruth, Young and Settles each notched four shots, with Ruth taking two shots on goal. Ultimately, though, the Owls had to wait until the second half to score. Junior goalkeeper Sarah Dalrymple picked up her third shutout along the way. She made five saves in the game, one of them a diving stick save off a La Salle penalty corner. Janney and company have two games left, one on the road against first-place Saint Louis and one at Geasey Field versus last-place Richmond. As it stands now, Temple occupies the fourth and final A-10 playoff spot. “We need the A-10 to play in our favor at this point, but we’ll stay confident and keep playing our game,” Janney said. Sophomore forward Katie Briglia’s goal sends Owls to A-10s. With two wins and two games remaining, the Owls are in danger of recording the least amount of wins in program history.